Filed under gadgets on June 21, 2015. Today I received a great Father’s Day gift for a gadget lover like me. The gift has taunted me for about a week. My wife placed a box wrapped in blue wrapping paper on my desk last week with a warning note attached that said: “Do not open until Father’s Day!” This morning, the box moved from my desk to the kitchen table and was presented with a fresh stack of hot pancakes and hot coffee. I do have a wonderful wife! 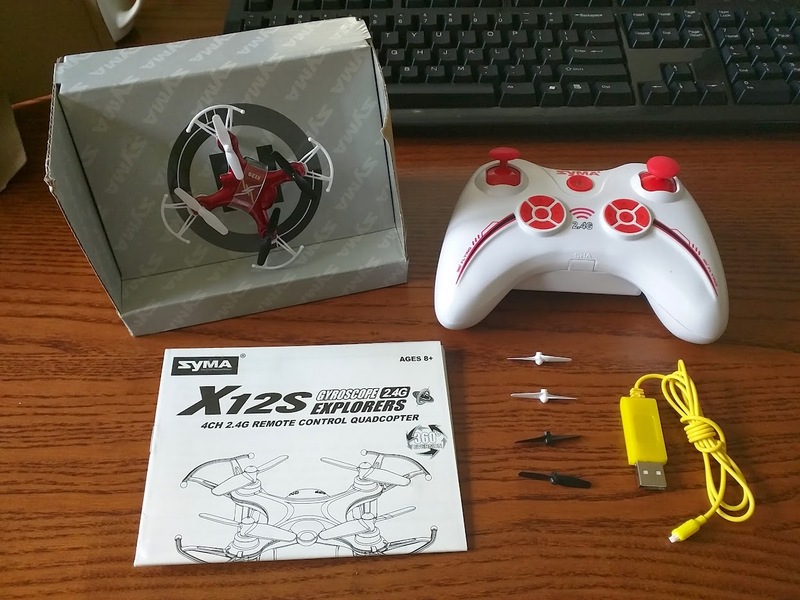 I unwrapped the box and inside was a Syma X12S mini quadcopter. I already own a larger Syma X5C1 that I discussed in an earlier blog post. After reviewing the larger quadcopter, I placed this smaller version in my Amazon Wish List, which is where my wife found the idea for the gift. In all honesty, I had forgotten about it, so this was indeed a nice surprise. The X5C1 purchased earlier is a full size quadcopter with a camera. This smaller Syma is drastically smaller with a total width of about 3.5 inches. 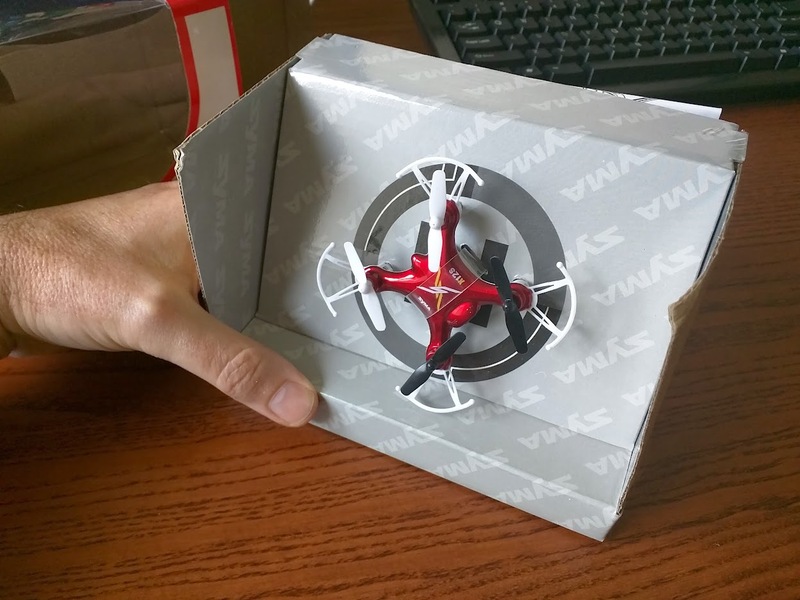 Syma describes it as a nano quadcopter. A comparison of the full size and nano is shown in the image below. Below are additional images. Comments appear under each image. 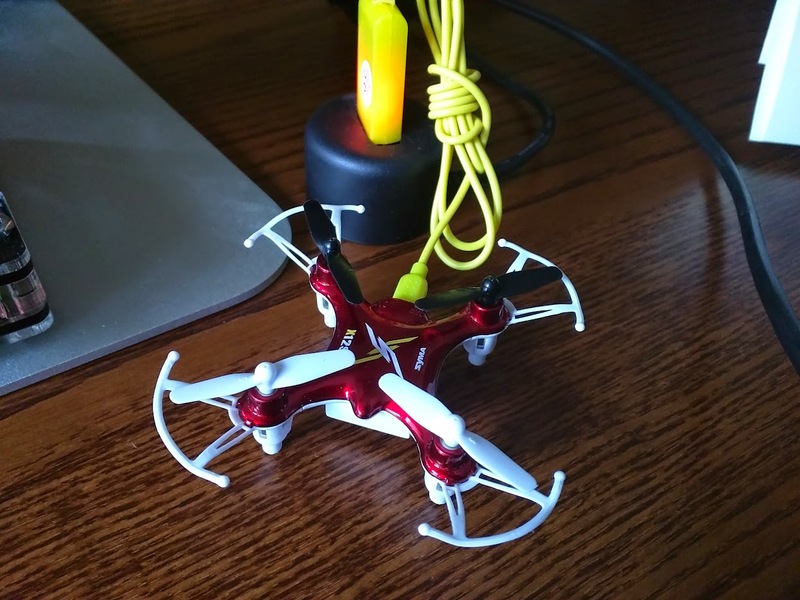 At the end of these images you will find my initial thoughts on this very affordable and tiny quadcopter. 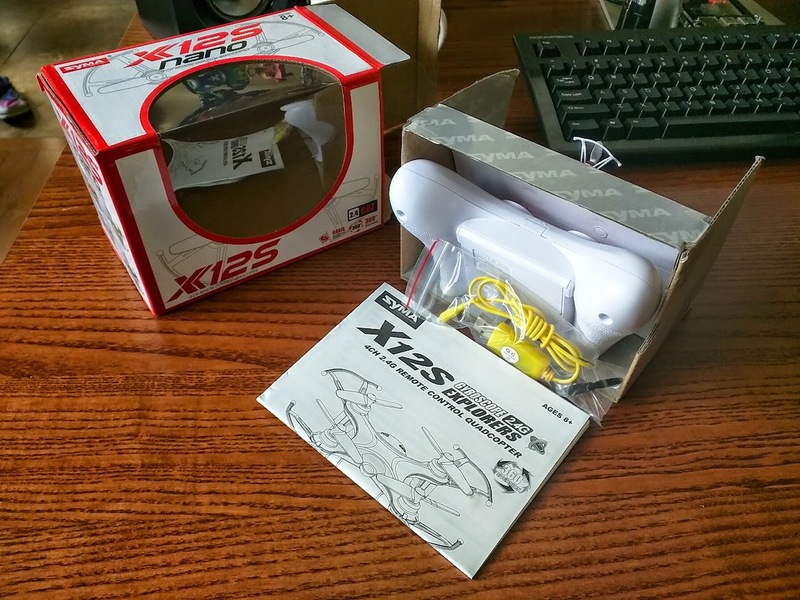 The Syma X12S packaging. Pretty spiffy looking in red and black. Available in four colors, but I think the red is the best of the lot. Time to open it up and see what’s inside. 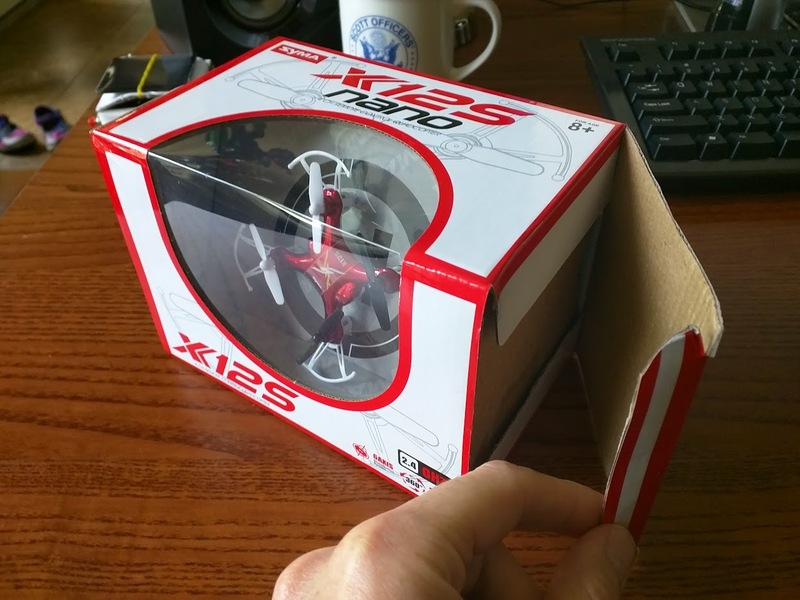 The quadcopter is held in place for shipping on this internal cardboard packaging. Flip the internal packaging around to reveal the other components. Inside we find the quadcopter, remote control, four extra blades, USB charging cable and some very poorly translated instructions. 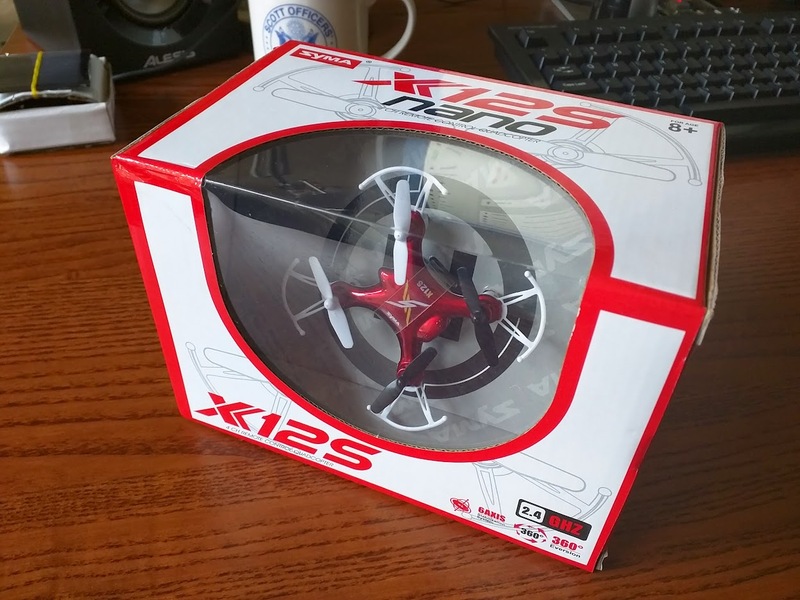 This is a good looking quadcopter. Time to charge for a first flight. Battery is charged when a red light appears on the USB charger. 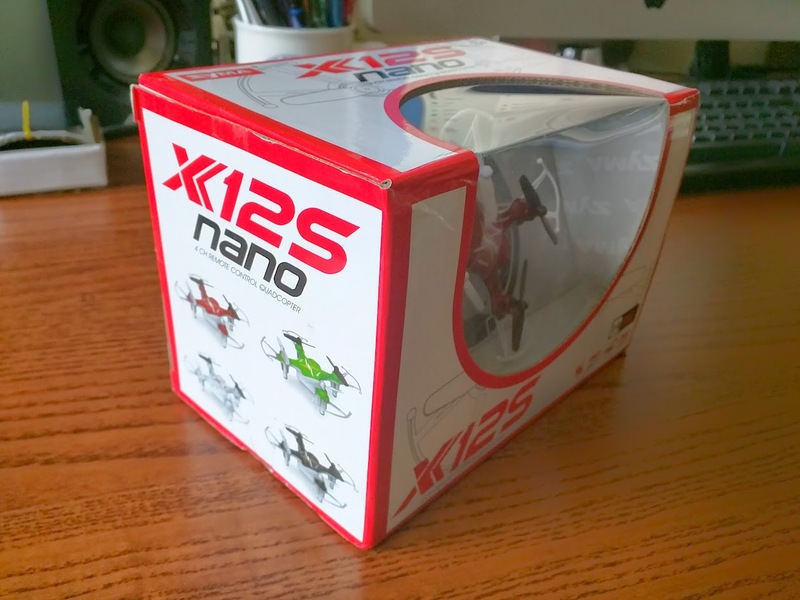 So there’s my quick summation of the Syma X12S nano quadcopter. Time to go. The Father’s Day food hasn’t stopped. My wife just grilled some hot dogs and bratwurst. By the time dinner is done, it will be time for another flight. If you would like to view other images of this diminutive quadcopter, check out the link below to the Google+ post that includes an album of images. Use the comments section below if you have questions or want to provide tips and tricks on quadcopter flying or ways to get even more value out of this model.